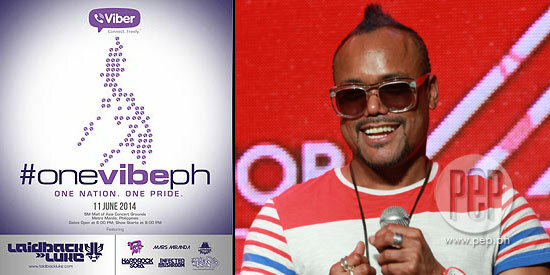 Apl de Ap (right) is expected to join the #OneVibePH party at the MOA concert grounds on June 11. Ticket prices are at P1000 for Patron tickets and P500 for students and Viber users. Send a Viber message using the hashtag (#OneVibePH) to 0911-VIBERPH to get the promo code when purchasing online. Viber, the leading free messaging application in the country, is mounting a thrilling party at the Mall of Asia Concert Grounds on June 11, 2014. Tagged as #OneVibePH, this event aims to integrate Philippine modern culture with modern music and encourage Filipino pride in terms of music and its artistry by bringing food and culture altogether in one big event. Described as Viber’s “most challenging event” this year, the company tapped experts in their respective fields: Domini Primero of Driven Manila and Stephen Ku of Eventscape to mount the said event. The 12 clubs mentioned are Aracama, Dillingers, The Distillery, Haze, Hyve, Imperial, Prive, Prohibition, Rebupliq, Skye, Time, Prive and URBN. Joining the headliners are Filipino Apl.De.Ap, Filipino-Dutch DJ Laidback Luke, Filipino DJs Funk Avy, Mars Miranda, and Motherbass. Foreign DJs will also join the event in support of Filipino talents such as HardRock Sofa and Infected Mushroom. Tickets are now available through SM Tickets at Tel. No. (02) 470-2222 or www.smtickets.com and through Ticketworld at Tel. No. 891-9999 or visit TicketWorld Online. Ticket prices are at P1000 for Patron tickets and P500 for students and Viber users. Send a Viber message using the hashtag (#OneVibePH) to 0911-VIBERPH to get the promo code when purchasing online.